We were on a weekend adventure and just got back this afternoon. This photo from my phone is a quick sneak peek at our getaway. I'll give you much more details and photos tomorrow hopefully. We drove to Lake Placid to celebrate our anniversary and to squeeze in a vacation. -I am exhausted and yet renewed....a funny paradox but needed. -I bought another notebook and because I have a notebook buying addiction convinced my husband to buy one as well. It worked! -almost every meal was with a lake view!- I could do that for every single meal for the rest of my life. See you tomorrow my friends with lots of photos to share. I'll look forward to seeing your photos. The sneak peak is GORGEOUS! Loved reading your list of things you did...sounds wonderful! Beautiful image- so peaceful....exhausted and yet renewed...wow, what great phrase Karen- I am so there. Sounds like a perfect weekend. Happy Anniversary! Beautiful photo... I'm glad you had a good get-away with the hubster. Look forward to seeing your pics and hearing more about it. Happy Anniversary, beautiful picture, you can never have enough notebooks! 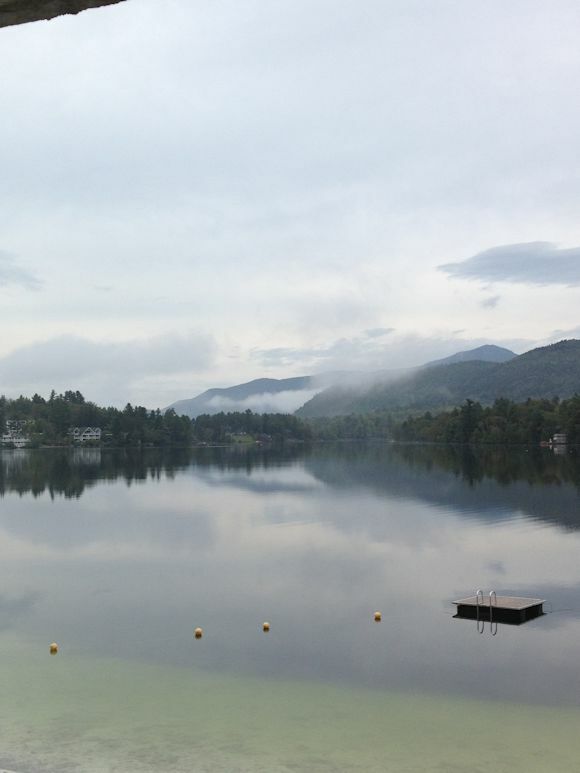 I knew that was Lake Placid as soon as I saw the picture :) One of my favourite spots. A perfect way to celebrate, can't wait to see more photos. Have the most wonderful day. I am looking forward to seeing you photos Karen. I have never been to Lake Placid [I've seen the movie though ;) ]. Eating too much while on vacation just seems to be the thing, but it's all calorie free right? That picture is breathtakingly beautiful! Happy Anniversary! Looks and sounds like a wonderful way to celebrate. Beautiful picture! I can't wait to see more of them, sounds like you visited a wonderful place. That photo alone is beautiful! I'm glad you go to go away for your anniversary. Sounds like it was all you were hoping for. Enjoy your week! It sounds like a wonderful weekend. Happy Anniversary! Can't wait to see the rest of the pictures. So beautiful! I can't wait to hear more! lake placid is wonderful! i spent some time up there one autumn when i lived in montreal and just loved it.